The Fold effect is used when bending a deformation further than the drawing is able to take it. 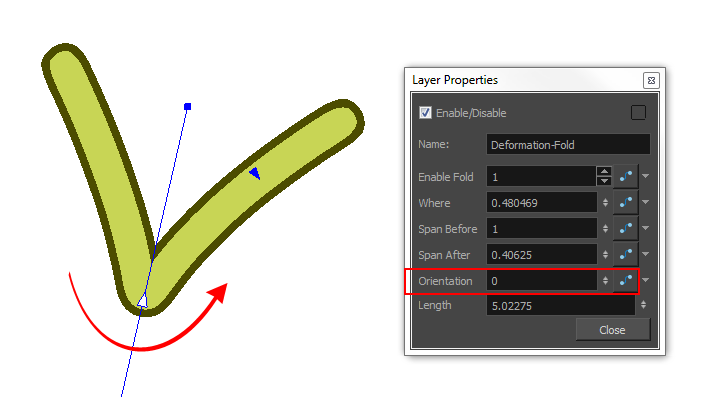 This may result in an unwanted overlap of the line art at the junction of the articulation or deformation. 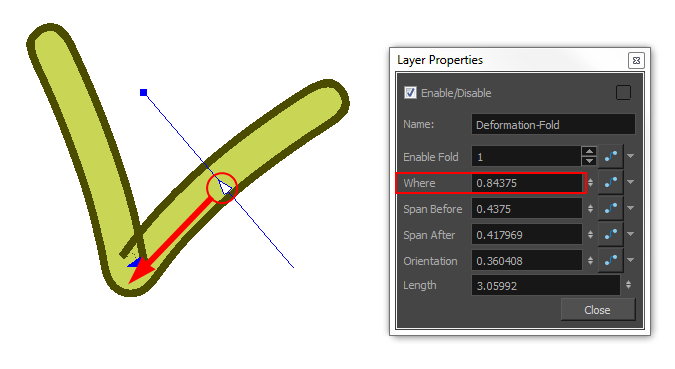 The Fold effect lets you control certain parameters that will help eliminate the unwanted line effect. You can also avoid this issue by separating your drawing onto two layers or separating your drawing in two pieces using the Cutter tool and repasting it in place in the same drawing. The Fold effect works best with the Curve deformers. In the Node view, navigate to the Deformation node causing the unwanted overlap (in this case, an articulation). In the Node Library view, select the Fold node and drag it to the Node view. 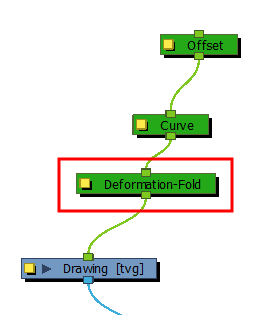 Connect the Deformation-Fold node directly under the deformation effect node which is causing the unwanted line effect. 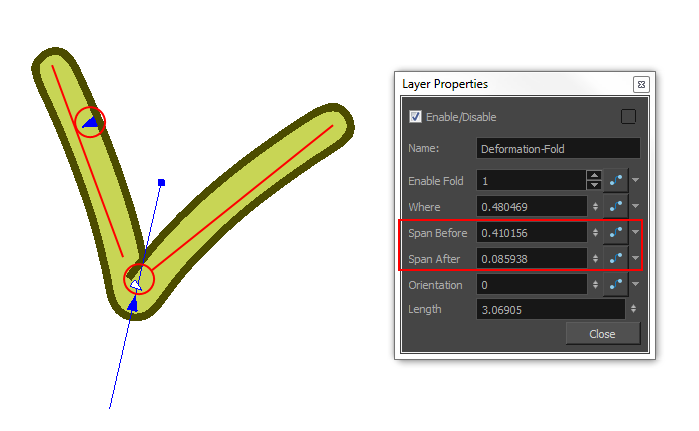 In the Node view, select the Deformation-Fold node. From the top menu, select View > Show > Control or press Shift + F11 (Windows/Linux) or ⌘ + F11 (Mac OS X) to display its controls in the Camera view. 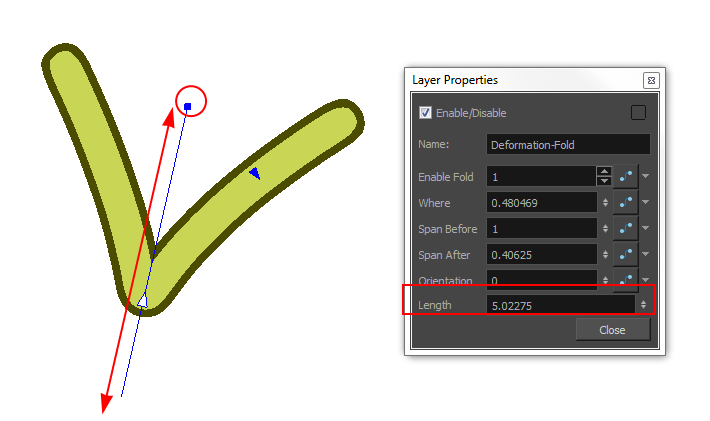 ‣ Use the axis’s square handle to lengthen or shorten the axis. If your character moves a lot and you need to adjust the fold at different positions to follow the limb animation, you can set up the Deformation-Fold node in a different position over time. To do this, enable the Animation mode in the Tools toolbar and add keyframes. In this case, the different values will be connected to functions. 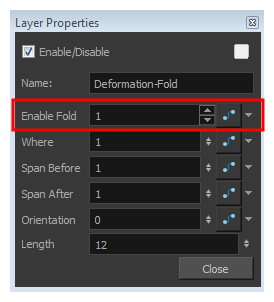 You can also enable/disable the Deformation-Fold node over time by connecting a function to the Enable Fold parameter in the Layer Properties. A value of 1 enables the effect, a value of 0 disables the effect.